"Soft yet supportive for a variety of sleeping positions." "Will please your wallet and your back." "Popular pick to customize the comfort and support of your bed." "Combines the support of coils and foam with the breathability of latex." "Order the level of firmness you think is right for you." "A good choice for back pain, according to reviewers." "A unique sleeping experience backed by a 100-night free sleep trial." "An all-natural, solid latex mattress that has 5 zones of support." If comfort and natural materials are motivating you to shop for a latex mattress, look to the Pure Green Natural Latex Mattress to meet your needs. This organic latex mattress uses natural ingredients to craft a sleeping surface that is soft yet supportive for a variety of sleeping positions. One of the top reasons people shop for a latex mattress is because they’re concerned with finding an all-natural mattress option. The Pure Green Natural Latex Mattress is made with 100-percent natural latex. Instead of traditional fire retardation chemicals, the mattress uses 100-percent organic wool as a natural fire barrier. The sides and backing of this mattress are finished with a soft, touchable fabric made from 100-percent organic cotton. As you can tell, this is a mattress made with a focus on natural materials - and it arrives with the authentic earthy scent to prove it. While some users commented on this earthy, barnyard scent, most people said it disappeared within a week or two. This organic mattress is made using the Dunlop latex method, which isn’t as springy as Talalay latex but instead offers more support and durability. Reviewers find this mattress to be soft yet supportive and say that it has worked for side sleepers and stomach sleepers. People with neck and back pain also report this mattress to be comfortable to sleep on without adding pressure or pain. While the Pure Green Natural Latex Mattress isn’t a total budget buy, it is affordable for a ‘green mattress’ and is considerably less expensive than many other all-latex mattresses on the market. You also don’t have to assemble the latex layers like some other mattresses require, which can save you hassle and time when setting up your new bed. If you’re looking to only spend a few hundred dollars on a new mattress, you’ll be hard pressed to find a full latex mattress—but this budget version from Linenspa is soft enough to please your wallet and your back. The Linenspa 10-Inch Latex Hybrid Mattress is constructed with 7-inch high individually encased coil springs, topped by 2 inches of latex and a 1-inch memory foam quilted cover. Since latex is temperature neutral and offers better breathability, many people find this mattress is better at dissipating body heat. So consider this mattress hot savings for your wallet and a cool deal for sleeping! While the company doesn’t specify whether the Dunlop or Talalay method is used in formulating this budget latex mattress, the fact is that most people find it to be suitable for sleeping in a variety of positions. The mattress itself is backed by a 10-year warranty against manufacturing defects. A latex mattress topper is a great way to customize the comfort and support of your bed without investing in a whole new mattress. The Pure Green Natural Latex Mattress Topper is a popular pick that can transform your sleeping experience. Whether you’re currently sleeping on a coil or memory foam mattress, you can reap the temperature-neutral benefits of latex and its springy support by adding this all-natural mattress topper. Some people have even used the Pure Green latex topper to soften the feel of a too-firm latex mattress. This topper will give any mattress a layer of springy latex to sleep on. Made with the Dunlop latex technique, this topper is frequently described as giving your bed a soft yet springy layer that won’t cause you to sink or feel stuck. One user points out that each side of the topper offers a different feel, so you can turn it over if you’re not wild about the feel on the first side. But chances are you will be satisfied one way or the other since this topper is by far one of the most popular latex mattress toppers. It has helped people fix saggy mattress issues and provided comfort for side sleepers and those with pressure point pain or sciatica issues. Be forewarned that this latex memory foam topper is heavy and also tears easily—making it a challenge to put it in place on your bed without losing any foam along the way. You may need a helping hand to meet the challenge successfully. A few people pointed out a naturally occurring rubber smell that dissipated considerably after a few weeks. If you like latex but can’t cut ties with a coil mattress, check out a hybrid latex mattress like this one from Lucid. The 12-Inch Queen Latex Hybrid Mattress has all the bases covered and is constructed with 6.5-inch steel coils, a layer of memory foam, and a latex topper to keep you cool and comfortable. Lucid offers a mattress that has exceeded the expectations of many people shopping for a latex hybrid mattress. Reviewers comment that the independently-encased steel coils minimize motion transfer while providing a level of support that memory foam mattresses like. With a section of memory sandwiched in between the coils and the top layer of latex, this mattress is a great combination of soft support and the springy feel that latex is known for. Additionally, people are quick to point out that this hybrid mattress sleeps cooler than solid memory foam mattresses they’ve previously tried. This is no surprise to latex mattress shoppers since latex offers a higher level of breathability and better temperature regulation than memory foam. The Lucid 12-Inch Latex Hybrid Mattress is described as having a medium firmness, however, some people found it to be too firm for their liking. In most cases, this was remedied with a softer mattress topper and didn’t affect overall satisfaction with the mattress. This latex hybrid mattress offers a good value for a mattress that combines the support of coils and memory foam with the breathability of latex. 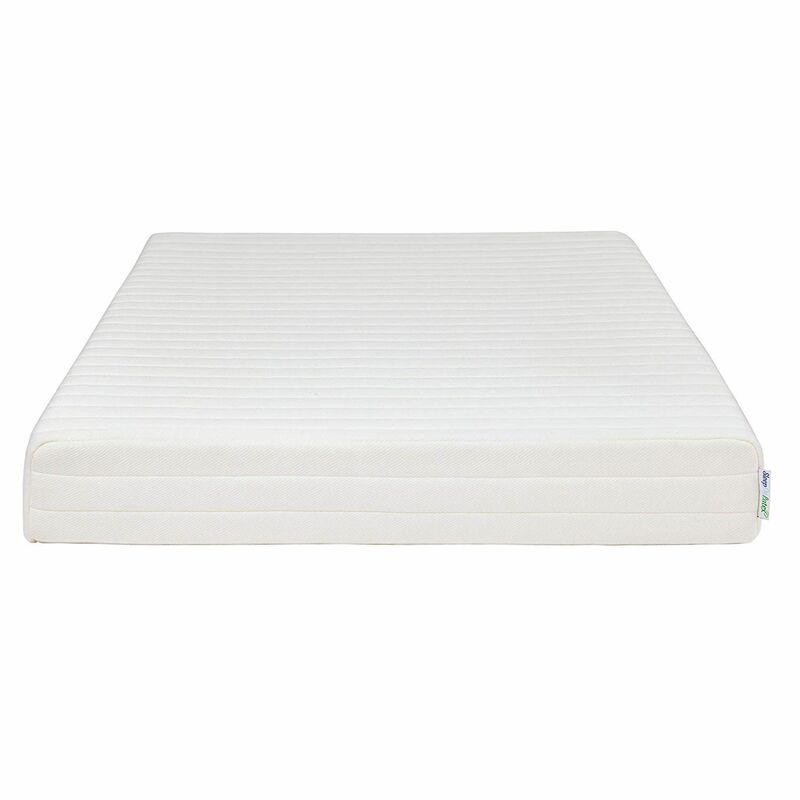 Side sleepers, or anyone looking for the perfect amount of softness and support, will appreciate the 3-layer construction of the Spindle Natural Latex Mattress. While many mattresses are too firm to allow side sleepers to comfortably rest their shoulders or too soft to support the hips and spine, the Spindle provides a mix-and-match option to let you get the support just right. This all-natural latex mattress comes with 3 layers of latex that together form a soft, medium, or firm feel. Order the level of firmness you think is right for you and your sleeping position but know that you can replace the layers if the support isn’t right or if one wears out down the road. While there is usually a charge to have a new latex layer shipped to you, it’s a much better deal than having to start over with a new mattress! Spindle uses a Dunlop manufacturing process to create each layer of latex that will go into your bed. These three 3-inch layers fit together inside of an organic cotton cover with wool batting inside for a natural barrier against fire. It’s also worth pointing out that this mattress is made in the United States. The Spindle Natural Latex Mattress is pricey and relatively new to the market but gets rave reviews from those who have tried it. If back pain is standing between you and a good night's sleep, you might want to consider a firm latex mattress, like the Latex for Less 9-Inch Natural Latex Mattress. This latex mattress is a good choice for back pain, according to reviewers that have struggled with various back and neck conditions. What makes this mattress a top choice is the fact that this option gives you two sleeping surfaces to try. One side is made with Dunlop latex for a firmer feel that many people with back pain appreciate. But if that side proves to be too firm, the reverse side is made with Talalay latex which has more give for a medium-firm feel. People that have tried the Latex for Less 9-Inch Natural Latex Mattress frequently say that it has relieved their back and hip pain during sleeping. However, the most frequent complaint is that neither side of the mattress is labeled to indicate which side is the firmer sleeping surface. Most people have found it to be a case of trial-and-error to find the side of mattress that works for them. Since latex mattresses are heavy and awkward to move, this can be an inconvenient process. Casper, a leading bed-in-a-box brand, is one of the few memory foam mattress makers to incorporate the benefits of latex into their mattresses. The Casper Sleep 10-Inch Mattress is a popular choice for sleepers searching for the best latex foam mattress. This is definitely a pricier option for a bed-in-a-box, with a queen mattress costing around $1,000, but the Casper has rave reviews and integrates latex and memory foam for a unique sleeping experience backed by a 100-night free sleep trial. Casper constructs their mattresses with 4 layers of support for the ultimate support without sacrificing comfort. Most notably, the top layer of this mattress is latex foam. The result is a mattress that offers the soft support memory foam is known for but adds the appealing properties of latex on top. Most notably, you’ll appreciate that this open cell latex foam mattress distributes and releases heat more readily than some other mattress materials, such as memory foam. This feature separates Casper from the sea of other memory foam mattresses on the market. People find that this mattress has more bounce compared to other memory foam mattress, thanks to the latex layer. Odor and off-gassing are occasionally cited as drawbacks for the Casper mattress, but this isn’t uncommon for both memory foam and latex mattresses. If you’re ready to make the splurge on an all-natural, solid latex mattress that promises sweeter sleep backed by a 20-year warranty, then go for the Zenhaven Latex Mattress. Zenhaven is a relative newcomer in the mattress market, but springs from parent company Saatva. Saatva is known for North-American made mattresses that focus on organic and eco-friendly materials. This all-natural, all-latex mattress is made with a softer Talalay latex on top, supported by 7 inches of firmer Talalay latex underneath for support and stability. While most people find the mattress’s ‘luxury plush’ firmness to be just right, you can flip the mattress over and sleep on the more solid ‘gentle firm’ side for more support. Like some other organic latex mattresses, the Zenhaven mattress uses 100-percent organic wool for fire retardation and 100-percent organic cotton for finishing material. A few things set apart this luxury latex mattress and make a case for justifying its $1,300 and up price tag. Most notably, Zenhaven has constructed the top layer (on either side) of this mattress to offer 5 zones of varying support to better support the spine, shoulders, and hips, rather than focusing on one level of firmness from top to bottom. Additionally, the Talalay latex used in the construction of this mattress is made in the United States rather than being imported. Finally, the company also backs its mattress with a 120-day sleep trial and a 20-year warranty, and currently offers free white glove delivery, installation, and old mattress removal. Our writers spent 3 hours researching the most popular latex mattresses on the market. Before making their final recommendations, they considered 16 different mattresses overall, screened options from 15 different brands and manufacturers, read over 190 user reviews (both positive and negative). All of this research adds up to recommendations you can trust.